Llamita, the counter-service sandwich shop from the team behind the Peruvian restaurant Llama Inn, has opened in the West Village. Its menu includes a duck sausage sandwich with cilantro, potato and chimichurri, and roast chicken with sides like arroz chaufa and quinoa salad. Lunch & Dinner daily . Llamita, 80 Carmine St., New York, NY 10014, 646-590-2771. Katana Kitten is a Japanese bar in Greenwich Village serving appetizers like nori crinkle cut fries, skewers, and "sandos" such as grilled cheese with yuzu-kosho. Masahiro Urushido (Saxon + Parole) is the head bartender and a managing partner. Katana Kitten, 531 Hudson St., New York, NY 10014, 212-243-3000. Oath Pizza serves funky pies made with hand-stretched dough that’s grilled and seared in avocado oil. With locations in Boston and Nantucket, the Upper East Side outpost is its first NYC pizza shop. Lunch & Dinner daily. Oath Pizza, 1140 3rd Ave., New York, NY 10065, 212-988-4300. Grimm Artisanal Ales is Lauren and Joe Grimm's brewery and taproom on the border of Williamsburg and Bushwick. Eli and Max Sussman of Samesa are behind the Middle Eastern food served there, but the stars of the show are the 10 tap lines of Grimm Artisanal Ales. Grimm Artisanal Ales, 990 Metropolitan Ave., Brooklyn, NY 11211, no phone. NoLIta café Charley St is from Australian chef-owner Dan Churchill. The menu features turmeric lattes; the Avo Smash among Toasts options; and colorful bowls such as Down To Earth combining arugula, garlic hummus, wild rice, mushroom, eggplant, tomato and onions. Breakfast & Lunch daily. Charley St, 41 Kenmare St., New York, NY 10012, no phone. NoMad's Cardoncello diVino takes its inspiration from the food of southern Italy. The Italian Cardoncello mushroom makes an appearance in main dishes, cocktails and even desserts. Cardoncello diVino, 43 W. 27th St., New York, NY 10001, 917-409-5995. Nonna Beppa is the first NYC outpost of Miami chef Giancarlo “Wendy” Cacciatori's restaurant, which is all about pasta, especially its famous tortellini. Cacciatori showcases his family recipes from the Emilia-Romagna region of Italy. Lunch & Dinner daily. Nonna Beppa, 290 Hudson St., New York, NY 10013, 917-639-3996. Anthony Mangieri composes his 12-inch Neapolitan pizzas, baked in a wood-burning brick oven, at Una Pizza Napoletana on the Lower East Side. The restaurant most recently had an outpost in San Francisco. 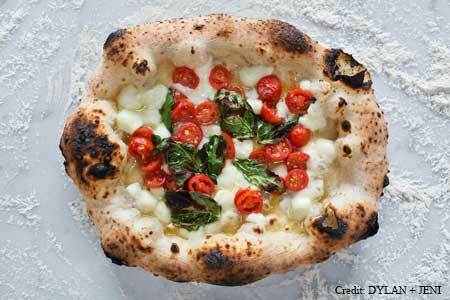 Una Pizza Napoletana, 175 Orchard St., New York, NY 10002, 646-692-3475. At Sous Vide Kitchen, where most dishes are cooked with the sous vide method, customers order from a digital kiosk. 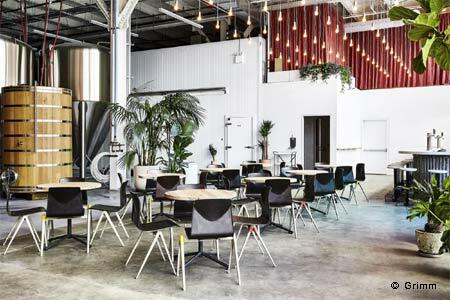 There are 50 seats where guests can stay to eat their baba ganoush, banh mi sandwiches and salads, or they can take them to go. Breakfast, Lunch & Dinner daily. Sous Vide Kitchen, 119 E. 23rd St., New York, NY 10010, 646-895-9232. Pastry chef Giacomo D’Alessandro has opened Polosud Gelato Coffee Pastries in Little Italy. In addition to gelato, the eatery also serves items like Sicilian cannoli and the classic Southern Italian breakfast treat “ciambellone della nonna.” Open daily. Polosud Gelato Coffee Pastries, 166 Mott St., New York, NY 10013, 646-476-6172.
by CHLOE. alum Julien Iaconelli has opened the Middle Eastern spot Panorama near Union Square. The fast-casual restaurant serves lemon mint and mango juice, freekeh with falafel, and french fries topped with chicken shawarma, garlic sauce and tahini. Lunch & Dinner daily. Panorama, 820 Broadway, New York, NY 10003, 212-204-6904. The owners of The Woods in South Williamsburg have opened The Breakers, a colorful indoor-outdoor bar nearby with a motif of skateboards and surfboards. Burgers, fries, tacos and crawfish boils are served. At night, there is plenty of dancing. The Breakers, 307 Meeker Ave., Brooklyn, NY 11211, 718-384-8900. French chef Daniel Boulud (of Daniel in New York City, one of GAYOT's Top 40 Restaurants in the U.S.) pioneered the "Gourmet Burger Revolution." So, it’s only natural that on Bastille Day, July 14, 2018, he launched "THE UMAMI FRENCHIE" with the famous UMAMI BURGER chain. (The timing was lucky as France won the 2018 FIFA World Cup the next day!) Discover the tasty burger, presented by Boulud himself, in this video. Then, go try it for yourself at UMAMI BURGER in Brookfield Place. Part of UMAMI BURGER's Artist Series, "THE UMAMI FRENCHIE" ($18) will be available until September 14th. One dollar from each burger sold will benefit charitable organization Citymeals, which provides a lifeline of nourishing meals and vital companionship to New York City’s homebound elderly. Umami Burger, Brookfield Place, 225 Liberty St., Ste. 247, New York, NY 10281, 917-728-4400. Dead Rabbit Grocery and Grog is closed until further notice due to fire damage. Dead Rabbit Grocery and Grog, 30 Water St., New York, NY 10004, 646-422-7906. David Chang's midtown restaurant Ma Peche closed after eight years in the Chambers hotel. Ma Peche, Chambers, 15 W. 56th St. , New York, NY 10014, no phone.